Rinzel, at right, receives the award. 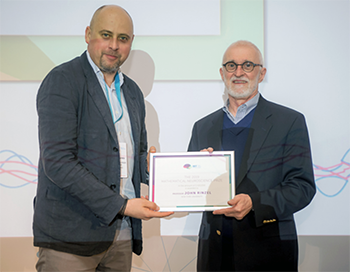 In early March, ISR’s friend and visiting researcher John Rinzel was honored with the IBT Mathematical Neuroscience Award at the Israel Brain Technologies’ (IBT) BrainTech 2019 conference. The prestigious $100K prize honors researchers who have significantly advanced understanding of the neural mechanisms of perception, behavior and thought through the application of mathematical analysis and theoretical modeling. Rinzel is a professor of neural science and mathematics at New York University who has played a pioneering role in the application of mathematical analyses to neural systems. His work has illuminated the understanding of the role of neural dynamics in cognition and behavior, with key contributions in fields ranging from neuronal biophysics to auditory perception. He has a long association with ISR, working closely with Professor Shihab Shamma (ECE/ISR) and his neural systems group. IBT is a non-profit organization whose mission is to accelerate the commercialization of Israel’s brain-related innovation and establish Israel as a leading international brain technology hub. Its Brain Technology Conference (BrainTech) is now in its fourth year. The Conference is a leading global meeting place for the neuro-innovation community. It presents a unique opportunity to connect and learn about the latest developments in brain research and brain technologies, engage with leading researchers, clinicians and industry executives, meet braintech startups, and participate in unparalleled discussions and networking opportunities, all geared towards fostering new collaborations.